Pearls are making a comeback in fashion thanks to the celebrities, who are acting as the driving force behind this shift. We often get asked how to properly wear pink pearl earrings. While white pearls will have their eternal beauty, pink pearls are appropriate for younger ages as well, So, we have dedicated this post to these lovely and delicate pieces of pearl jewelry. Furthermore, these beautiful pink pearl earrings can be paired with many precious stones for a distinct appearance. Thus, pink pearls offer you an array of attractive options to choose from. Keep reading to find out how celebrities are rocking this kind of pearl earrings and how you can incorporate them in your outfits. Quite like the classic white pearls, pink pearls enjoy great popularity amidst the pearl wearers. The degree of the ‘pinkness’ could range from a pleasing baby pink to a loud magenta, from a faded peach to a vivid apricot. Hence, there is always a pleasing shade of pink for you to choose from, even if you are very specific. Including pink pearl jewelry is the first step from moving on from white and adding a splash of color to your accessories. 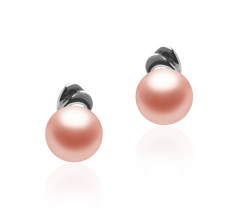 Thus, if you are starting out on your love affair with pink pearls, you can always start off with earrings! Pink pearl earrings can make quite a statement. Read on to know more about how to wear the pink pearl earrings perfectly. In natural conditions, a conch pearl (pink pearl) is a very rare gemstone. It is created by the queen conch, also known as the pink conch. Pink pearls are a by-product of the conch fishing industry. Since these pearls are quite rare, they are also rather expensive. Hence, a large section of pearl lovers prefers pink dyed pearls, which is easier on the pocket. For commercial purposes, freshwater pearls are mostly used to synthesize natural looking pink pearls. These freshwater pearls are dyed professionally to give them a pink shade. Dyeing gives the painter the control on how intense or pale the pink tint should be. This fact points out that personalization with pearls is quite simple since one can get a pearl as per the color that they desire. When it comes to selecting the pearls for dyeing, freshwater pearls that are positioned closer to the hinge are largely considered due to their natural shades of pink and cream. Pearls have the magical ability to make your skin glow but this stands true provided that you have chosen a shade that would be fitting for your skin tone. Don’t be discouraged because if the pairing is done right, the benefits are equally rewarding. The ability of the pearls to catch and throw diffused light will illuminate the wearer. However, some shades of pearls complement certain skin tones better than the others. The pink blush of the pink pearls has a warm overtone, so does the golden nacre and hence this combination gives rise to a pale pink undertone, which will offer warm highlights to the skin. Therefore, women having a fair complexion would look absolutely stunning sporting pink pearl earrings. Since earrings should also complement the hair color, those having light to medium dark brown hair or blonde hair will find that their hair color highlights their earrings. Also, due to the warm nature of the color scheme, most women usually prefer wearing pink pearl earrings set in yellow gold. Pink pearl earrings could be a good start to introducing your jewelry collection to various hues other than white. They are totally adequate for younger ages as well. You can even offer them as a graduating present or sweet sixteen gift. Earrings with pink pink pearls are versatile and can be worn on various occasions. Thus, here are some tips and advice on how to wear pink pearl earrings suiting the event. For your daily requirements, a pink stud is a suitable choice. Studs are comfortable and suit almost all attires. However, remember to choose a small to medium size (5 to 6mm) pearl in your stud, especially if you have a petite build. On the other hand, if you have prominent features, you can settle for a larger pearl (9 to 10mm). Whether your clothes are a shade of warm pink and red or the cool blue and purple, the pink pearl earrings will easily suit your style. If you are younger and want to use the conflicting themes of warm and cool, you can have the pearls set in silver metals, like in the Aria Pink Pearl Earrings set. If you are dressing up for a flashy party, then don’t forget to wear your trusty pink pearl earrings. It is important to strike a balance between your earrings and neck piece. If your neck piece should be the center of everyone’s attention, then you should pick out plain and simple pearl earrings. You may even sport pearl studs. However, that does not mean that you have to look boring! In fact, find a pair of studs that have pearls with diamonds to add the glam factor in your getup. Not just that, you could even get your hands on a pair of dangling pink pearl earrings with diamonds that can really complete your ensemble. PINK wearing pink pearl earrings?! YES! And we love how wonderful she looks! Those fine pearl earrings are just the right classy touch to her outfit. Even plain dangling pink pearl earrings, like the Cerella Earring set, can add a touch of refinement. The diamonds will put a spotlight on you with all the glitter. For a plain necklace, you can shift the focus to your earrings by getting a pair of gorgeous pink pearl earrings that will steal the show. The Rozene pearl earring set with its 9-10mm pearls and diamonds will be perfect to bring on your bling on any dress. Offices are pre-dominantly male spaces and therefore, you can create a niche for yourself by putting on your feminine pink pearl earrings. Your piece of jewelry can become a fashion statement or even better – a symbol of empowerment! Every working woman should have at least one pair of pearl earrings because they scream ‘professional.’ You will find people listening to you more keenly and respecting your opinions, all thanks to the powers of your earrings. Once again, work environments call for hassle-free pearl studs but on special days, you can always wear something a bit more visible. The Marcella earring set, for example, is discreet but swings tastefully at the slightest movements. These pearl earrings along with a string of pink pearl necklace will make you feel like a powerful businesswoman. A quick and easy way to make your outfit regal is simple: invest in a good nail polish. Get a shade that is similar to the earrings that you wish to wear. The contrast of the clothes with the pearls will be balanced out by the polished nails that sync with the color of your pearls. It is important to consider the shades and hues of your entire set before putting it together as a ‘set.’ Mostly, a pearl jewelry set contains a ring, which may be optional, bracelet, earrings, and necklace or pendant. Ensure that these individual pieces are all of the same shade. To make this task easy, you can simply purchase the entire set instead of trying out the combinations. Use a shade of makeup that is similar to the shade of the pink pearls and goes well with your skin tone. This way, when the pearl reflects the natural light, your skin will be glowing. Makeup products are available in pearly shades so picking one color that would go well with your jewelry would be a wise decision. Eyeshadows and blushes could camouflage in the base of pearly hues while eyeliner and lipstick could be a bold shade that will stand out against the backdrop of the pearly canvas. Accentuate your prominent facial features and you are all set to win over hearts. Just because you need to choose portions of your makeup and outfit that would complement your pink pearls, it does not mean that you need to paint your entire self in the same shade. To make a bold statement, pick up a dress that is contrasting with the shade of your pink pearls. White or Pastel clothing items will look ravishing in companionship with pink pearls. With all these in mind, we really hope you will have a better idea on how to wear pink pearl earrings with flair, irrespective of the occasion. Feel free to explore with the various shades of pink pearl earrings available in our collection. The sheer variety available in a particular color will stun you and you may have to purchase more than one piece in the same color just to stock up on jewelry that will suit all shades. Take a leap from the regular white and grey and venture into the pink. We recommend wearing pink pearl jewelry directly over bare skin. This way, they will beautifully meld with the background, while standing out and gleaming. So go ahead and think pink now! This entry was posted in pearl earrings, PearlsOnly Blog, pink pearls by PearlsOnly Team. Bookmark the permalink.